There's a somewhat-new (added in 2013) series of videoscreens at the very end of the queue for Expedition Everest in Disney's Animal Kingdom. This will presumably become part of MyMagic+ and give personalized shout-outs to visitors, courtesy of MagicBands. 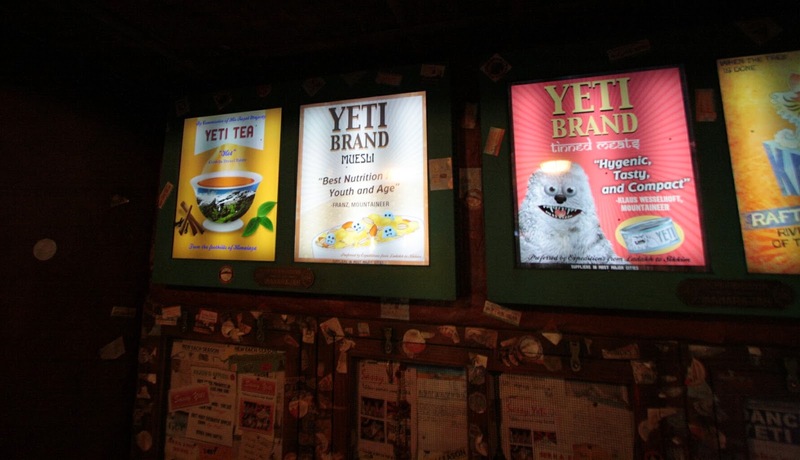 One screen shows a fanciful yeti product. But look closer. There are two references here to Disneyland's yeti attraction, the Matterhorn, which opened decades before Expedition Everest. First, the fake quote by Klaus Wesselhoft is a clear reference to a character in the movie Third Man on the Mountain (1959), played by Lee Patterson. That movie was about the real Matterhorn, but in filming it, Walt realized he wanted his own Matterhorn at Disneyland, so that was built concurrently. 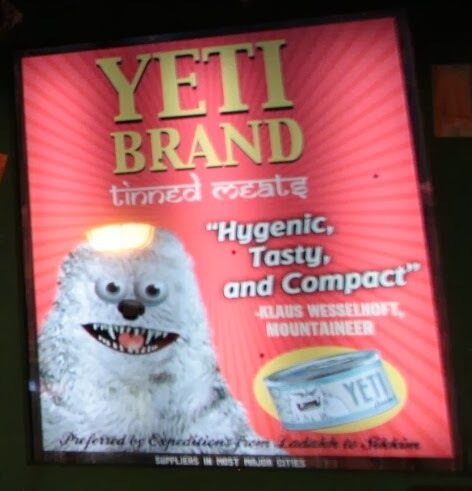 Then, examine the tin of yeti meats and you'll see yet another representation of the mythical creature. That alone is no surprise; the whole conceit of the queue is that we don't know exactly what he looks like, so there are lots of different images. But THIS image looks a lot like the Abominable Snowman from Disneyland's Matterhorn (added years after Walt died), which would make it a second tribute on the same poster! Disneyland's Harold; photo copyright Disney.